With wit, adventure, and style to spare, this gripping and utterly original thriller is "a spy story that sticks" (The Dallas Morning News). When Charlie Clark takes a break from his latest losing streak at the track to bring home his Alzheimer’s-addled father, Drummond, they’re attacked by two mysterious shooters. At first, Charlie thinks his Russian “creditors” are employing aggressive collection tactics. But once Drummond effortlessly hot-wires a car, Charlie discovers that his unassuming father was actually a deep cover CIA agent . . . and there is extremely sensitive information rattling around in his troubled mind. Now the CIA wants to “contain” him, so the two embark on a wild chase through the labyrinthine world of national security that will force them to confront unspeakable danger, dark conspiracies, and what it means to be a father and son. Keith Thomson is a former semipro baseball player in France, an editorial cartoonist for Newsday, a filmmaker with a short film shown at Sundance, and a screenwriter who currently lives in Alabama. He writes on intelligence and other matters for the Huffington Post. 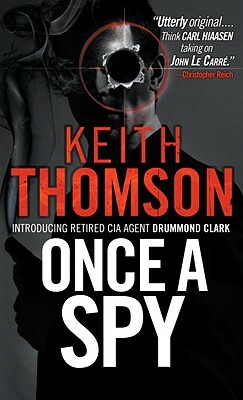 “I like my spy thrillers cold, and Once A Spy is as cold as they come, but with a warm sense of honest family dishonesty and violent sense of humor. . . . A wonderfully fun novel of discovery, matching explosive apartments with explosive revelations.”—Rick Kleffel, "The Agony Column"